Obituary – Mills, Opal Leola (Hughes) « Perry High School Alumni Association, Inc.
﻿Opal Leola Mills, 82, 1008 Fifth street, died at her home late Tuesday afternoon. Graveside rites have been scheduled for 2 p.m. Friday at Grace Hill cemetery. Brown Funeral home will be in charge of arrangements. A memorial has been established to benefit the Oklahoma Medical Research Foundation. 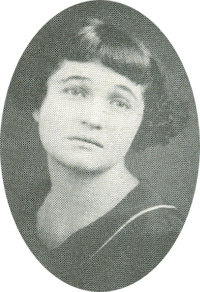 She was born at Perry, Oct. 3, 1908, the daughter of Ray and Jennie Hughes. She was a graduate of Perry high school and Oklahoma A&M. Mrs. Mills taught at Lone Star and White schools. She and Henry Mills were married on Dec. 9, 1927. Mrs. Mills was a member of the First Baptist church. Survivors include one daughther-in-law, Dixie Mills, Perry; six grandchildren, eight great-grandchildren and several nieces and nephews. In addition to her husband, she was preceded in death by two sons, one grandson and one sister.